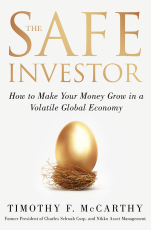 The Safe Investor was created out of a need for individuals to navigate the complex, seemingly risky and volatile markets for investing. Although investment tips are everywhere, from TV, written, and online media dedicated to producing the wealth of information out there, many people have not taken the steps to educate themselves financially on these crucial investment topics, and most feel uncomfortable with how they should actually invest their money. Recent predictions about slowing economic growth, historically low interest rates, and volatile markets have investors scratching their heads about what to do with their money. And more than ever, people are scared about whether they can grow their money enough to last through their lifetime. Expert investor Timothy McCarthy has spent the last 30 years in the US and overseas providing investment solutions to individuals and their advisors. He believes that understanding how to create a truly globally diverse portfolio while applying the magic of time will help all investors navigate risky markets. McCarthy also explores the fundamentals of picking and evaluating financial advisors for those who want to understand the principles of investing but not actually do the work themselves. Tim helps guide the reader along a straightforward path to investment success by telling engaging and actual stories to illustrate each of his seven lessons of successful investing. The Safe Investor will help even those readers with little interest or aptitude for finance to be comfortable in knowing what to do to manage their life investment plan and how to manage their own advisors.